Uber is to block customers in Australia and New Zealand from its ride service if they have a low passenger rating. Riders rated four-out-of-five stars or lower will be banned for six months. Ratings are based on feedback left by drivers after each journey. The move is aimed at improving passenger behaviour, the company said. Uber told the BBC that Australia and New Zealand had been identified as a place to bring in the rule after feedback from drivers. The same policy was introduced in Brazil earlier this this year, Uber said, but it's the first time the control has been rolled out in an English-speaking market. An Uber spokeswoman declined to be drawn on exactly how many of its 2.8 million users in Australia and New Zealand currently had ratings of below 4.0 - but conceded it was only "a few thousand". The "vast majority" - believed to be more than 90% - had ratings of at least 4.5, the company said. The policy will kick in on 19 September and passengers will receive several warnings before they are banned. 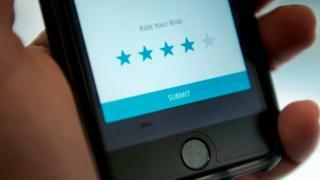 Susan Anderson, general director of Uber in Australia and New Zealand, said riders with a 4.0 rating or below would have received a number of one-star reviews from drivers. "These are the small percentage of riders who are persistently not treating drivers with respect," she told Channel Seven's Sunrise programme on Wednesday. What's wrong with doing make-up on a train? She said drivers expected basic courtesy from riders. Poor behaviour included users not being at their pick-up spot, or organising pick-ups in unsafe areas on the road. "Be polite and considerate. Take your rubbish with you and don't make a mess in the car," Ms Anderson said. The company sent out a number of tips to users last month aimed at improving customer scores.